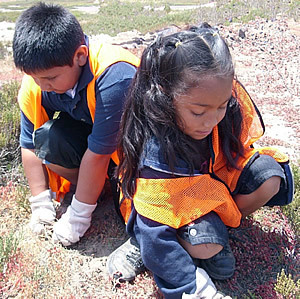 The Bolsa Chica Stewards are The Restoration Team of the Bolsa Chica Land Trust. The Stewards welcome ICO groups to their regular work days on the first Sunday and third Saturday of each month, 9:00 am to 12:00 noon, and will occasionally schedule a special day for older, motivated, hard-working students. When filling out a trip form to Bolsa Chica, make sure to indicate the meeting place. The bus can drop off students at Warner Avenue parking lot of at Pacific Coast Highway parking lot. Working at Bolsa Chica in the morning and going across to the beach for lunch and recreation is a good combination. Reservations and a lifeguard are required for the Bolsa Chica State Beach.